Elijah Huhges shoots from 3. Mandatory Photo Credit: Kicia Sears, The Juice Online. And right now, Syracuse’s record of 13-5 says that they’re good but not great. Perhaps pretty good? But the path they’ve traversed to arrive at that record has been a bit odd. Two losses at Madison Square Garden, albeit to UConn and Oregon. And three losses already in the friendly confines of the Carrier Dome. Yet the Orange remains undefeated in three road games. And yes, you read that correctly. Syracuse DOES leave New York for true road games, despite tired narratives from those who continue to push them. With ACC play a handful of games old, the league standings are as you might expect; jumbled. North Carolina leads the pack at 5-1 with four teams – Syracuse, Louisville, Duke, and Virginia all a half game back at 4-1. The bottom of the league is as crowded as the top. Miami, Notre Dame, Wake Forest, Florida State, and Boston College have all stumbled out of the gate to marks of 1-4. After hosting Miami on Thursday night, Syracuse plays three straight road games in eight days. The outcome of those three games could very well position the Orange for the remainder of the ACC regular season. Sweep all three and they’re probably fighting Duke, UNC, and Virginia for conference supremacy. Lose all three and they’ll find themselves on the wrong side of the bubble. The fun starts Saturday in Blacksburg. The Hokies might be in a bit of a foul mood having just come off a 21-point drubbing at North Carolina this past Saturday. And after suffering a thrashing by Virginia earlier this month, VaTech is running out of opportunities to claim wins against the top teams in the league. The Hokies won’t see UNC again until potentially the ACC Tournament and they get one shot versus both Duke and Carolina. Syracuse will certainly have their attention. The Eagles’ talent pool took a severe hit when Jerome Robinson departed for the NBA after last season. Ky Bowman – Robin to Robinson’s Batman – was left to fill the leadership void while compensating for some needed scoring punch. The season has been a struggle for BC thanks to home losses to IUPUI and Hartford, though, a home win against Florida State recently snapped a five-game skid. But the Eagles are exactly the type of squad Syracuse can’t overlook. Despite a recent loss at Syracuse, Jeff Capel has done a respectable job taking over a Pitt program that bottomed out last year finishing the season on a 19-game losing streak and going winless in league play. Pitt already has two league wins. Knocking off the Orange is just the type of signature win Capel needs to give the fans hope while helping to attract ACC-caliber recruits. 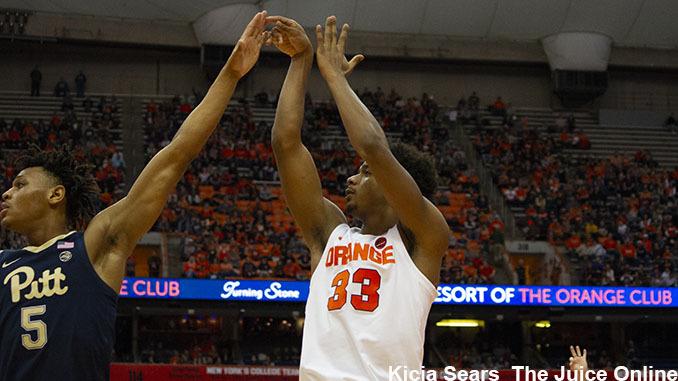 Despite sporting five losses through only eighteen games, Syracuse is undefeated in true road games with wins at Ohio State, at Notre Dame, and at Duke. To counteract some of their earlier losses, Syracuse must hope that road games continue to taste like home cookin’.